I wonder if anyone else in the world feels butterflies in their stomachs when turning off Pacific Avenue South onto Garfield Street. It has been three years since my graduation, and I have made the trip every summer since for one reason or another—to sit in on an alumni reading or take in a craft talk. Though returning this summer for a mini-residency was certainly different, is it corny to say that, more than anything, I felt like I had come home? I pulled into the parking lot, walked into Harstad Hall, up the stairs, and into the sauna that would be my room for the next four days. First things first: I plugged in my fan to get the air circulating and got out my bags of snacks that would sustain me after 9 p.m. Taking out the schedule, I reviewed all the yellow-highlighted sessions that mapped out my next four days: “Mystery Techniques” with Suzanne Berne and Marjorie Sandor, “First Chapters” with David Allan Cates, “On Gordon Lish’s Editorial Violations of the Work of Raymond Carver” with April Ayers Lawson, and every morning craft talk. More than I ever knew I could fit in, but I was willing and ready to try. The truth is, I had come from a year of almost zero writing. After having the amazing fortune of getting my book published in the previous year, I immediately jumped right into a new project, motivated by my own idea and the inevitable, constant pressure from others: “What are you working on now?” Initially, I made pretty good progress on it, too. I scratched out a short story here and there. I was living the writer’s existence. But then there was a job change. I was given a one-year assignment to the local high school (as Associate Principal) to support a completely new administrative team. This was fine, though in my 27 years as an elementary guy, I had never worked with high school students. One would think there would be endless fodder for writing material here, and that was absolutely true. But I quickly found that in spite of this, by the time the evening or weekend came, I was wiped out. Between bomb threats and lockdowns, drug and alcohol issues, sexual harassment investigations—and, at one horrible point, a student suicide—there was no room in my head for creative endeavors beyond my own emotional survival. I had the realization that my energies had to be focused on the priorities at hand, and writing my novel was simply not up there. So I turned it off, and I looked ahead to the summer. I had the realization that my energies had to be focused on the priorities at hand, and writing my novel was simply not up there. Now, here I was, at the Rainier Writing Workshop residency again. I left my dorm room and made my way to the University Center. In many ways, it was just like my first day of the program. There were the unfamiliar faces, all excited to see others. I kept expecting to see my friends, my old cohort, grabbing time to practice our skit for the Rapid City Social Club in the sweat-inducing, joyful space of the Northern Pacific Coffee Company. But some things you can’t go back to, and maybe there is good in that. Is it odd to find oneself leaning into the “social” piece of a writer’s residency, above the actual writing? Perhaps, but I’ve learned over the years that the social and craft are, for me, intertwined. My own writing and work constantly remind me that I am “a writer” based on what I churn out. There’s nothing like being in the company of other writers to validate that and to light the fire under me to make me want to create more. When fellow alumni discovered one another in the crowd, I found myself needing to compare our reasons for being there, to share the hopes we each had for the next few days. To temper our expectations a bit, because who knew what would really be there for us? We were all seeking an infusion of creativity and motivation, but also basking in the great comfort of being where we were right then, with both familiar and new faces, faculty and participants. No, it didn’t feel the same as before, but the real reason we were there—to learn, be inspired, write—was there waiting for us. 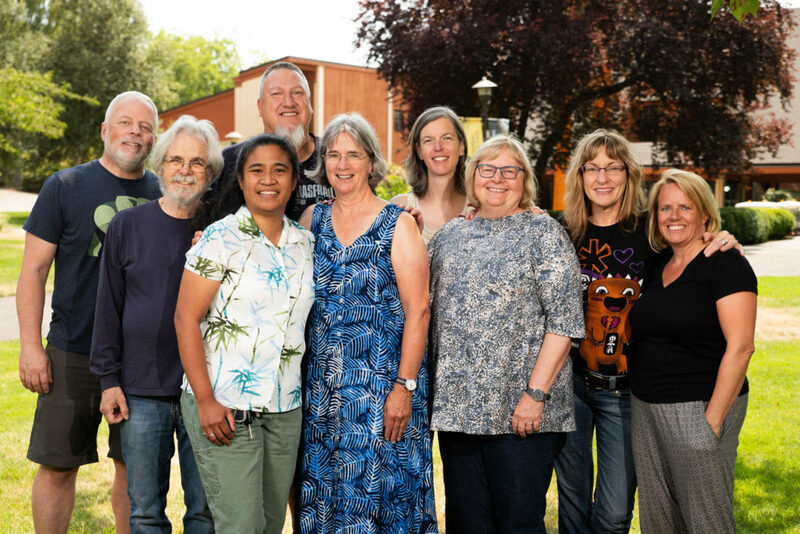 As quickly as we found each other, we alumni drifted off to our selected sessions and workshops, and, in time, I did connect with these amazing writers who were new to me, and our conversations were as rich and useful as my RWW conversations had always been. The joy of being “in the thick of residency” was complete. Left to right: Warren Read ('15), Gerry McFarland ('08), Mike Hunter ('17), Rebecca Mabanglo-Mayor ('12), Anne Donaghy ('15), Jennie Goode ('14), Christine Parker ('14), Marj Hahne ('15), and Lisa Connors ('17). Photos by Jason Comerford. Yes, the return to residency was exactly as I’d hoped—the feelings of camaraderie, creative enthusiasm, and friendship. Late nights sharing beer and music and laughter. Did it happen exactly as before, as it was in my full residency? Of course not. It was certainly condensed, but the rewards were substantial and every bit worth it. So here I am three months out, nearing the end of the draft of my novel. The mini-residency slapped the paddles onto both my project and my motivation, and it jump-started me to complete the last hundred or so pages. I now feel like I’m just a few weeks away from having a solid draft I can start sending out. It’s as if I am able to completely erase the creative wasteland that was last year. The notes I gleaned from the craft talks and sessions and the sparks generated from the many readings and moments of creative interaction with other writers are still pinned to my corkboard. In the margins of handouts still in my RWW folder are the guideposts for the revision work I’m doing and the seeds for future stories that live in my head. But the greatest takeaway from the return to residency is the gift that I was hoping for when I registered: I’m writing again. Warren Read is the author of the 2008 memoir, The Lyncher in Me (Borealis Books), and the 2017 novel, Ash Falls (Ig Publishing). His short fiction has been published in Hot Metal Bridge, Mud Season Review, East Bay Review and Switchback magazines, among others. In 2015, he earned his MFA from the Rainier Writing Workshop. Currently he is an assistant principal on Bainbridge Island, WA.